The growth of yoga and meditation in the US since 2012 is remarkable | "Global Possibilities"
The number of Americans who meditate has tripled. Yoga is up 55 percent. In 2017, about 14.3 percent of US adults surveyed said they had done yoga in the past 12 months. That’s up from 9 percent in 2012. Yoga and meditation, two ancient practices, are now officially the most popular alternative health approaches in the United States, each used by around 35 million adults. That’s the word from two reports from the Centers for Disease Control and Prevention out Thursday, which looked at the changes in the use of yoga, meditation, and chiropractors between 2012 and 2017. In 2017, about 14.3 percent of US adults surveyed by the CDC’s National Center for Health Statistics said they had done yoga in the past 12 months, while 14.2 percent had meditated, the reports show. 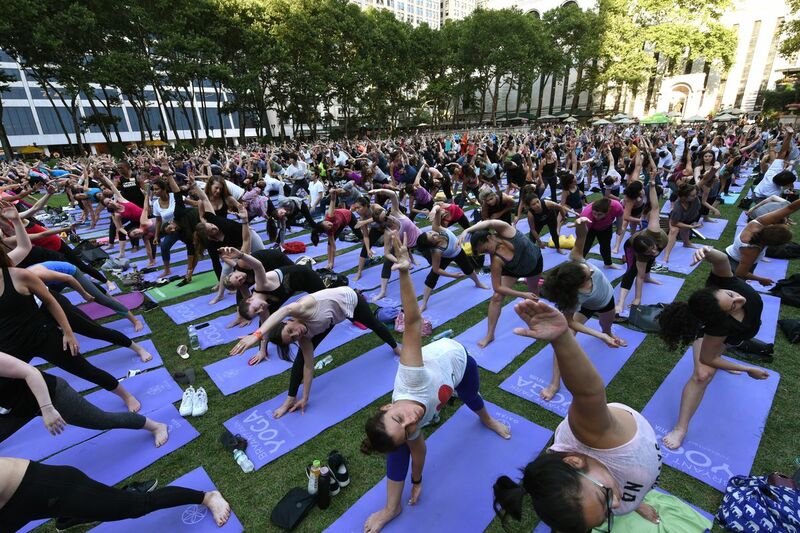 That’s up from 2012, when 9 percent were doing yoga and 4 percent meditating. And it’s not just adults; more kids are doing yoga and meditation too. In 2012, fewer than half a percent of kids had meditated, while now it’s now 5 percent. Yoga for kids grew from 3 percent in 2012 to 8 percent last year. The report also showed a smaller increase in Americans’ use of chiropractors: It climbed from 9.1 percent in 2012 to 10.3 percent in 2017. The big growth in yoga and meditation is clearly linked to better availability, with a boom in studios, classes, and apps, some of them free and online. But as more Americans find they are struggling with mental health issues like anxiety, distraction, and physical issues like chronic pain, they’re seeking therapies that don’t involve pharmaceuticals. Scientists like Davidson, meanwhile, are finding that yoga and meditation can be at least somewhat effective for a wide array of health concerns — with few side effects. Here’s a quick summary of what we know about yoga and meditation’s potential health benefits. Researchers who have studied the health effects of yoga say it’s probably just as good for your health as many other forms of exercise. But it seems particularly promising for improving lower back pain and, crucially, reducing inflammation in the body, which can help stave off disease. There are also several randomized controlled trials suggesting that yoga may improve quality of life for diabetes patients, reduce cardiovascular disease risk factors, and even help people manage high blood pressure. How can this be? One possibility has to do with inflammation. You can think about inflammation in two ways. There’s helpful inflammation, as when your body’s immune system mounts a response to bacteria in a cut. There’s also harmful inflammation. When you’re stressed, your body’s inflammatory response can go into overdrive, hampering its ability to fight off viruses and disease. People who are inactive or obese or who eat an unhealthy diet have higher levels of harmful inflammation. And researchers have found associations between inflammation and various chronic diseases, including cancer, cardiovascular disease, and diabetes. Yoga — like other mind-body exercises such as tai chi and meditation — seems to be particularly helpful in reducing harmful inflammation. A 2014 meta-analysis on the effects of mind-body therapies on the immune system found that yoga reduces inflammation-based blood markers. So did this 2014 randomized controlled trial looking at women with breast cancer and breast cancer survivors. Michael Irwin at UCLA’s medical school, one of the authors of a 2015 descriptive review on inflammation and mind-body exercises, told Vox, “When you look at the aerobic exercise necessary to decrease inflammation, people have to maintain very vigorous levels.” But not with yoga, he continued. “Even practices with minimum levels of physical activity [like Iyengar stretches] can have large effect sizes.” Researchers don’t yet know why, though they think the meditative components of yoga, tai chi, and meditation may have something to do with it. There is low- to moderate-certainty evidence that yoga compared to non-exercise controls results in small to moderate improvements in back-related function at three and six months. Yoga may also be slightly more effective for pain at three and six months, however the effect size did not meet predefined levels of minimum clinical importance. So while this isn’t an end-all treatment, the evidence we have points in the direction of a benefit. And that’s why, in February 2017, the American College of Physicians advised doctors and patients try “non-drug therapies” such as exercise, acupuncture, tai chi, yoga, and even chiropractics, and avoid prescription drugs or surgical options wherever possible. Mindfulness meditation has been practiced in East and Southeast Asia since the Buddha began teaching it 2,600 years ago. At the time, he didn’t consider it a spiritual practice but rather a tool for achieving clarity, peace of mind, and liberation from suffering. In the past few decades, it has taken off in the West, with the help of teachers like Thich Nhat Hanh, Jon Kabat-Zinn, Chogyam Trungpa Rinpoche, and Jack Kornfield. Recently, scientific researchers have shown in clinical settings that mindfulness meditation can reduce anxiety and depression, as well as pain. Though there are few randomized controlled trials on meditation and mental health, a 2014 meta-analysis by Johns Hopkins researchers for the Agency for Healthcare Research and Quality found that meditation, and in particular mindfulness, can have a role in treating depression, anxiety, and pain in adults — as much as medications but with no side effects. Meditation can also, to a lesser degree, reduce the toll of psychological distress, the review found. When it comes to kids, more and more schools are implementing mindfulness meditation programs. The research on meditation for kids is still fairly preliminary, but a meta-analysisof randomized controlled trials of mindfulness-based interventions in kids and adolescents published in October in the Journal of Child Psychology and Psychiatry found there were significant positive effects on executive functioning, attention, depression, anxiety/stress, and negative behaviors. Though there’s clearly momentum around yoga and meditation, new reports also show that access to these tools isn’t equal. White adults were more likely to use yoga and meditation compared with Hispanic and black adults. And as more people see yoga and meditation as a business opportunity, “there’s a challenge around preserving the authenticity of these practices and ensuring they are taught with fidelity,” said Davidson. That means respecting and sharing the long history of the practices, and teaching them in a rigorous way.